Stephen Doyle of 98fm has been covering The Dubs for the past seven summers and fancies the hurlers and footballers to overcome Cork. 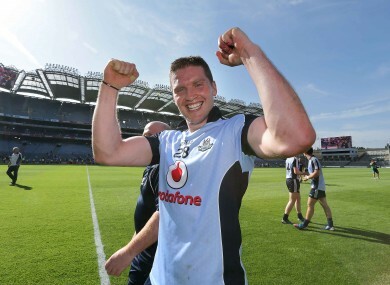 Conal Keaney celebrates Dublin's win over Galway. WHEN STEPHEN DOYLE started in 98fm, Humphrey Kelleher was managing the Dublin hurlers and Paul ‘Pillar’ Caffrey was in charge of the footballers. As a sports reporter for the Dublin radio station, he has witnessed some Leinster and National League highs but All-Ireland success has been in short supply. Now, with Dublin drawn to play Cork in the hurling semi-finals and last football quarters, Doyle feels double success is on the horizon. Doyle, primarily, covers the footballers while colleague Philip Egan tracks the hurlers from the capital. The reporter, then, became the fan on 7 July when Dublin beat Galway to clinch their first Leinster title in 52 years. Following Dublin’s Division 2 trophy win earlier this year, Doyle feels the hurlers are in with a better shot of landing more major silverware. He said, “Peter Kelly has been absolutely phenomenal this year and can run all day. He’s a great marker too. It is great to see Stephen Hiney come back from his cruciate injury. He came on in the replay against Wexford and showed what a fantastic player he is. He is one of the key ingredients for Anthony Daly’s side to achieve success. Doyle watched Cork’s impressive five-point win over Kilkenny on Sunday and feels that the semi-final will be close. He added, “Jimmy Barry Murphy has got a young side there, who many may not have expected to get so far. As Pat Gilroy used to say, they are in bonus territory now but they are coming up against a seasoned Dublin side. “As for the footballers,” Doyle added, “that is almost the opposite. Cork are the battle-hardened unit while Dublin have brought in a lot of new lads and lost some experienced heads. They didn’t have the best game in the world against Meath [in the Leinster Final] but they went in trailing at half-time and turned it around well to win by seven points. The weakness, I feel, is the space that they leave at the back. – Stephen Doyle is one of the presenters of Now That’s What I Call Sport on 98fm. Email “'I expect to be reporting on Dublin in two All-Ireland finals'”. Feedback on “'I expect to be reporting on Dublin in two All-Ireland finals'”.